In a (fairly) recent blog post, the always awesome auntie pixelante waxed poetic about how Bubble Bobble designer Fukio Mitsuji used "visual information to help the player understand the rules of a game." Specifically, she focused on how Mitsuji explained, visually, using the giant frying pan seen in the screenshot below, the behavior of the game's fire/flame bubbles. "Players pop the bubbles and the flames fall down to the wide, flat surface of the pan, which then catches fire--like cracking an egg and dripping it into a frying pan to sizzle," she writes. "The enemies that inhabit this stage bounce diagonally through the air; when they come down they touch the fire, pop into the air and come down as food that the players can gather. The word “POPCORN” written on the screen makes the metaphor complete." If you're interested in game design in general and Bubble Bobble in particular--and who isn't interested in the latter?--I'd highly recommend reading the rest of pixelante's post (here). That is an interesting post. 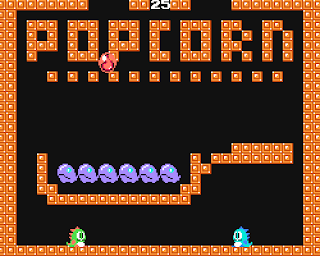 I've never played bubble bobble but I do generally like games that use the visuals to explain the rules. My first stage of annoyance with a game usually coincides with the first time that I have to go rummaging through my stuff to find the manual to explain what I am supposed to be doing. Justin: Me, too! Although I guess that's obvious by now, huh? Sean: Wait a second... Are you tellin' me you've never played Bubble Bobble? How is that possible? My god, man, get yourself a copy of this game, pronto. It's one of the best ever, IMO. If you have a PS2, I would highly recommend buying a copy of Taito Legends, which includes the arcade version (aka the best version) of this game. Otherwise, look for the Famicom Disk version, although I think that one's kind of pricey. I'll second that, Sean. If nothing else, the music will stay with you for the rest of your life. LOL, I do have a copy of it... for the Famicom Disk System. Which I have four of. None of which work. I absolutely HAVE to get one of them working, just to play that game! The two of you have massively piqued my interest! Not to oversell it or anything, but, honestly, it's one of my favorite games of all time. Oh, OK, now I understand :) I forgot that you don't have a working Disk System. If you ever get one of them working -- or if you buy one that works -- you'll have to let me/us know what you think of this game! I will. I love having something to look forward to - I'm running out of "great" Famicom games that I haven't played yet and I kind of enjoy Bubble Bobble out there teasing me like this. You can play it in simultaneous 2 player mode too, right? I love 2 player Famicom games.